Additional Info: Katya - experienced performer, accompanist, ensemble player and piano teacher having graduated with BMus, based in Chingford. 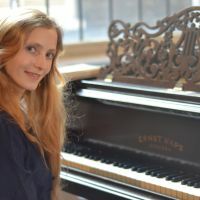 She is available for rehearsals, concerts, exam preparation, festivals, master-classes and piano lessons. The prices are depending to your location, duration of each session and normally may vary between £22-£35 each. Payments are in cash or cheque. Discount applies for pre-booked multiple sessions. See above website for the details.